Some mornings, despite our best intentions, just don't go smoothly. I had one of those mornings today: Small tasks complicated themselves into larger ones and I found myself leaving the house later than I should have. I exited our driveway with the intention of taking the quicker route to work, along the highway, but was so distracted while waiting at the light that I turned from habit in the other direction, the one that takes me along the winding back roads, past the river estuary and through farmland on my way to the office. I realized almost immediately what I'd done and, for a brief moment, contemplated driving around the block to take the route I'd intended, but then decided to continue on my way. Along the counrty roadsides, the grass is, in places, taller than I am and, ripened by our unusually dry weather, coloured a deep, rich gold. Heads of deep yellow tansy and goldenrod, both more often seen in August than July, bloom in great swaths along the edges of long-dry ditches. Vetch, so un-melodic in name and glorious in both profusion and colour, winds its tendrils around and through everything. 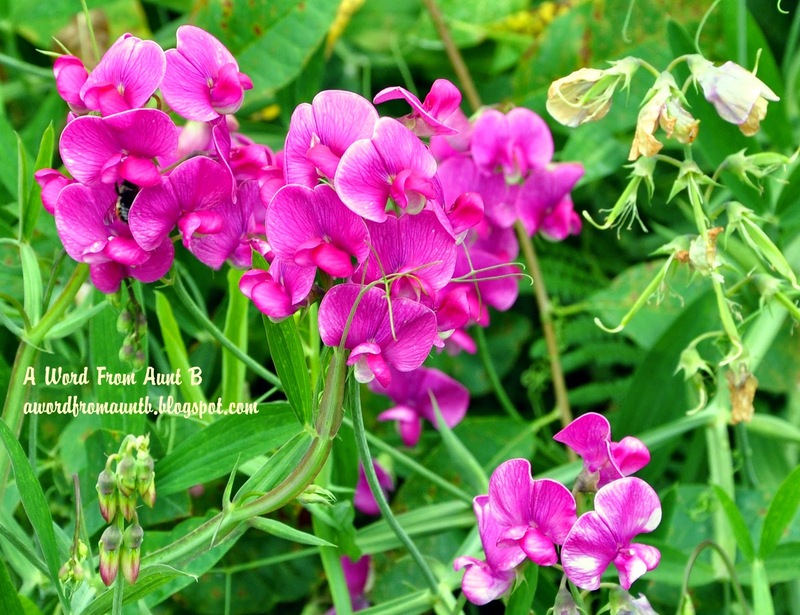 Its sweet pea blossoms bring complimentary pinks and purples to sea of gold and yellow. Its roots bring a gift of precious nitrogen to the soil beneath. Small, vivid hummingbirds feast upon it, their emerald chests glinting in the sunlight as they vie with one another for the best blooms; diving and chasing like tiny spitfires. So fierce! Completely ignoring the aerial combat taking place around them, fat bees and delicate butterflies busy themselves among the vetch too, and in places where it tangles with the grass, small rabbits find both shade and camouflage in which to wait out the heat of day. Quail scurry in and out of the maze of stems and small birds forage for grass seed and insects. In the last farm field I pass on my way to work, the ripe seed heads atop the unmown grass form cloudy drifts of soft heather purple. Sheep graze there, their black heads bent down to crop the stems at their bases, their backs forming grey tussocks among the heather haze. Lambs, small enough that the tall grass can hide them completely, make their presence known in play. They leap above the height of those nodding seed heads, and chase each other energetically, their energy bringing a smile to my face as I pass by. I need not have wasted even a moment in worry about being late. I arrived at the office in time, grateful that habit had blessed me with a peaceful journey, calmed by familiar sights on quiet country roads. Wherever your journey takes you today, I hope you can find a moment or two to enjoy the gifts, both small and great, it brings to you. Whatever you find yourself doing today, I hope you can pause, draw a breath, and be reminded that hurry and worry are thieves of time and happiness. Breathe deeply and stop for just a moment to notice at least one thing that brings you joy. Draw a blanket of calm around your shoulders and open your heart to the blessings of day.